Share the post "Rubber Duckies"
It looks like starting tomorrow, we’re going to be bracing for a few days with high heat indexes. With all the rain we’ve had, there’ll be all that much more humidity. Several more people mentioned today the unfortunate water seepage in their basements from those two storms that started exactly a week ago. There are several of my current listings that are still bone dry which is certainly going to make them more marketable. I was at one home today where I could see where the water created a gully from the amount, along with force of that rain. It must’ve been like watching a flash flood somewhere in a desert where dry stream beds turn into raging rivers. I’ve still been busy with my buyer looking for something in Clear Lake. After what I heard today from a very good source, it sounds like we’re quietly heading back to the same situation we had in 2008 when the market crashed. As far as I’m concerned, there are too many tenants on already tight budgets who are buying homes. It’s not that buying a home is bad, but rather a few of their reasons for purchasing, which I have a problem with. As I’ve said before, home buyers/owners absolutely must have residual income which they can sock away for un-expected repairs. They somehow forget that when you own instead of rent, you can’t call your mortgage company like you would your landlord when your refrigerator or hot water heater goes out. And by the way, hot water heaters are getting even more expensive. I just paid $1,100.00 to replace mine that just went out and it was only eleven years old. The plumber said the prices went up due to another government regulation that went into effect. I also blame some of our landlords for their tenants buying instead of staying put, simply because they’re charging too much for rent. Many of their mindsets are, “If I can get such high prices, then I’m going to ask.” One of the very old investors who still owns a number of properties said to me not long ago, “My tenants stay the longest because they know I take care of them by keeping their rents down and making repairs when needed.” I’d say that’s a pretty good mindset to have if looking for long term returns without all those “in and out” moves every six months to a year. As chance would have it, one of the people from NIACOG called today to remind me about their $5,000.00 loan program which is under-utilized in our area. When he refreshed me on the details, I thought about my listing at 1104 – 16th St. NE here in Mason City which is a fixer-upper in a good neighborhood. For example, if someone would purchase that home in say the $30K range, NIACOG would give a second mortgage of $5K to be used as part of say a 20% downpayment loan and/or their closing costs. The real bonus of that loan, is that the first payment on it doesn’t start for two years. It is amortized over a 60 month period and the interest rate is fixed at 3%. Even asking for a loan from a family member wouldn’t be that enticing. The one catch, it that it’s only for owner occupants, so if someone would purchase that home, they’d have all the more extra money to make repairs and updates and not have to worry about making any payments on NIACOG’s $5K loan for two years. If you know of any industrious people you know who’re possibly looking to start out small and build some quick sweat equity, please tell them about NIACOG’s program along with 1104 – 16th St. NE. 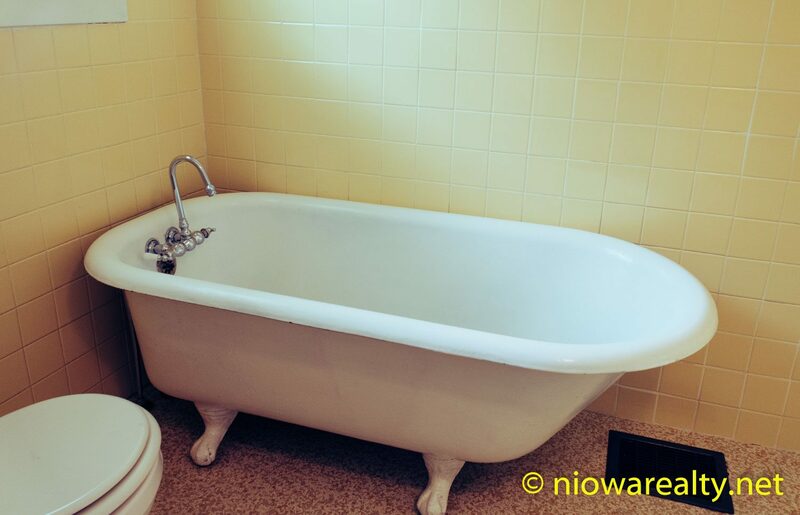 I went out to a see a potential client today, and while she was showing me around, I couldn’t help but admire her vintage claw foot bathtub which is pictured above. I said to her, “How do you manage to keep it in such good condition?” She laughed and said, “Each time I use it, I make sure to rinse it out and wipe it down which takes me less than a minute.” If she only knew how many others I’ve seen that were the filthiest. Now can’t you see yourselves in that tub filled and near over-flowing with bubbles while playing with your rubber duckies? A few of you may already know there’s a much broader message in tonight’s one-liner which I rarely, if ever hear anymore. Tonight’s one-liner is: If it looks like a duck, walks like a duck, and quacks like a duck, then it must be a duck.